hilarious! 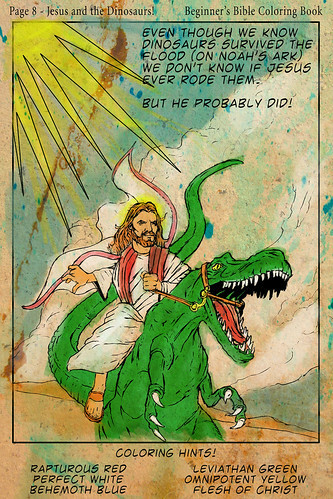 take note, it's not just jesus on a dinosaur, it's jesus on a dinosaur holding an alligator (or something) with pterodactyl's in the background!!! docrix: Ok this is really disturbing. Love it. sean dreilinger: is this a comment on creationism vs. evolution? miss.love: i found this picture on a website about a new conservative encyclopedia to compete with wikipedia called conservapedia! the section on dinosaurs is HELLARIOUS!!! i've decided to homeschool my kids so i can teach them a bunch of made up stuff that i thought up in the shower. then i'll make a reference website that they can refer to just to prove it's true. GENIUS!!! miss.love: he doesn't need a light saber, he's got a frickin' ALLIGATOR!! raul.montes: This is actually from a film Mel Gibson & Spielberg are producing, using elements from The Passion & Jurassic Park. miss.love: “The Passion of Jurassic Park”… I love it! 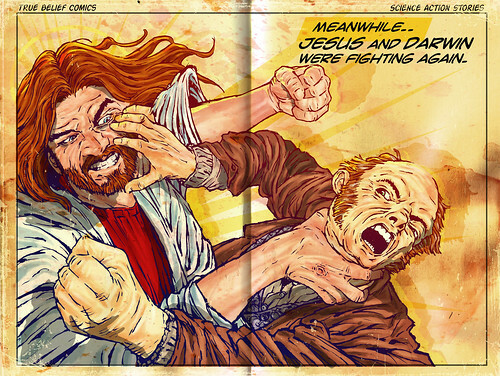 mighty soap: If you need more crazy jesus, check out jesusoftheweek dot com. Frickin' hilarious, especially when these things are meant to be serious. I think this is one of my faves though. Thanks for sharing. cowicide: Has Palin seen this yet? miss.love: i think she painted it. Massimiliano Benini: Hi, I'm an admin for a group called Personal Jesus, and we'd love to have this added to the group! || Ron ||: I believe God created the universe then Earth then dinosaurs before humans. : * (: this was a Sermon at the church of Wasilla ! steveartist: While intelligence is limited, ignorance is (sadly) boundless! At one time about 95% of all those polled thought that the moon was made of green cheese and the Earth was flat. Our lot in life seems to be that we must suffer religious imbeciles. droopy19: If you read the bible, you will see a passage about a dinosaur in there. 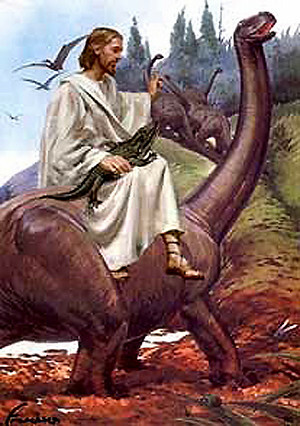 Very interesting, am wondering how they knew about dinosaurs back in the early days of the bible. droopy19: Oh, I almost forgot, we also have a site of dinosaur tracks along with humanoid tracks as well (in arizona). I wonder how that happened. francesca232: I am so excited that you found our booth and that the mystery has been resolved! Long live dinosaur Jesus!